The second big race of the year came in the form of a challenge by #TheCrazyOnes tribe. That is to say, my dear friends Stefan Christoph and Cook it Fit blogger Cris. Following our joint adventure in the Madeira Island Ultra Trail, Stefan and Cris wanted to relive an experience where sport and friendship get seamlessly together. As we’re running together one day, Stefan started talking about the Zugspitz Ultratrail and how he planned to do his first 100 km trail run there, excitement overflowing from his eyes, an adventure thrill in the tone of his voice, memories of past holidays taken in the region coming into words, sweet remembrances shaping up in our own minds as vivid photos of what we imagined it to be. The Zugspitze is the highest peak of the Wetterstein Mountains, a mountain group separating the southern region of Bavaria from Austria’s beautiful Tyrol region. At 2,962 m above sea level, it is part of Germany’s highest mountain and hence a famous tourist attraction. I had heard about it often before and loved to stay in its neighbouring town Garmisch-Partenkirchen back in 2005 during a family road-trip. The idea of going there for a proper trail race, enjoying beautiful trails in Germany’s most acclaimed mountain, was definitely something to explore further. The great thing about the Zugspitz Ultratrail is that there’s a race for every taste and a location for every mood. The organisation has laid out an amazing cooperation between the municipalities surrounding the mountain, regardless of which country they’re based in. On the German side, beautiful Grainau serves as the starting location of the 102 km ULTRATRAIL race and contains the finish line of all races. Garmisch-Partenkirchen hosts the shorter 25 km race distance of the BASETRAIL and Mittenwald the 39 km BASETRAIL XL. On the Austrian side, Leutasch is the starting point of the 63 km SUPERTRAIL, Ehrwald completing the race portfolio with the 81 km of the SUPERTRAIL XL. 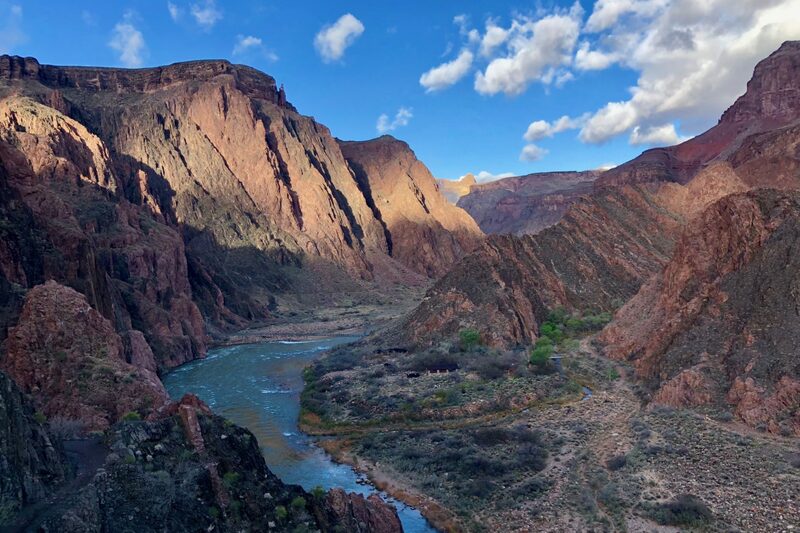 The great thing about it is that you can choose the distance which best suits you, as well as the location which pleases you best to use as your base camp. I decided to join the 63 km SUPERTRAIL as the means to challenge myself on a long distance, while at the same time allowing a proper recovery of MIUT‘s 85 km, done just a couple of months ago. Besides #TheCrazyOnes Stefan and Cris, it was great to be able to plan the race as a family and friendship event. My wife and kids came along, as well as good friend Sachin with his own family. The stage was set for a fantastic long weekend in the south of Germany. We all met in Grainau on Friday, the day before the race, to enjoy the electrifying atmosphere of the small town. At the end of the valley, the place had turned itself into a trail mecca, runners coming from all four corners of the world to join the party of Germany’s most emblematic trail race. As we picked up our bibs, one could sense the vibrant enthusiasm that everyone shared. There was not a single location in town where runners wouldn’t be seen, sporty clothing as casual dressing, new gear being tried out here and there, running talks everywhere, smiles all over. The SUPERTRAIL XL race hosted the Deutsche Trail-Meisterschaft (German yearly championship), which only contributed to the overall excitement of having another reason to celebrate. As we planned the journey, we had the choice of staying at the epicentre of the race in Grainau or to stay close to my race’s starting location in Leutasch. We took the latter, which was a great decision, given we could enjoy all the buzz surrounding Grainau, as well as the loveliness and quietness of the small Austrian village of Leutasch-Weidach. While it felt cumbersome to think about the car commute during the days we’d be staying in the region, turns out we found just the right balance that allowed us to explore more of all the different places around the mountain, most of which somehow involved in the race event. Bio Landpension Monika was the accommodation we chose to stay at. Gosh…! We couldn’t have chosen better! Words are difficult to describe what we felt while staying at such a lovely location with such wonderful people. Theresa and Alessio received us in their fully biological pension with welcoming hearts, had an absolutely breathtaking early morning breakfast available for us and provided the best recommendations to have a truly remarkable holiday experience. The taste of those grilled vegetables in the morning is a memory that I won’t soon forget. All natural ingredients, a deep sense of caring for nature and a profound connection with their surroundings, we are so grateful to have had the opportunity to stay at their place… it was the first but won’t definitely be the last! The following are the places we’ve visited upon Theresa’s recommendation, which have been spot‑on suggestions! The Leutascher Geisterklamm is a beautiful gorge located in the direction of Mittenwald, containing a series of elevated steel walkways over the river flowing below. Similar to the one we’ve visited on our Eiger Ultra Trail adventure, the kids loved it! Spectacular views, pristine water streams below, panoramic views over a tall bridge connecting two mountain flanks over the valley, the sounds of water and birds all around… the place is a must visit in case you’re in the area. The Almenparadies Gaistal is a hiking route west of Leutasch-Weidach, which stretches over the picturesque Gaistal valley. The trail head is easily accessible by car, with several car parks available. Theresa told us it would be great for the kids as the elevation gain was not too much – and neither too steep. And she was right! We wandered our way up calmly, between green pastures and forest patches of untouched beauty. A place of silence, the kids enjoyed being close to the vegetation and the diverse species of animals around: birds, insects, reptiles, cows… we were truly surrounded by a mountain setting, a place where civilisation has, fortunately, left nearly no mark. An easy way to get kids relaxed with free entertainment? Get them to the local swimming pool, of course! The Erlebniswelt Alpenbad Leutasch offers tourists staying in town free entry with the Leutasch Card. A large indoor pool with a connection to an outdoor one, water inflatable toys, a big slide… a amusing afternoon for the whole family. If I talk about a pristine lake in an alpine setting, what is the first thing coming to mind?… a blissful paradise, for sure! Fortunately fairly unspoiled, the Eibsee offers hiking trails around its shore, a location to have food next to the car park and several leisure activities on the lake itself, such as sailing, kayaking and obviously swimming. We took our picnic blanket and laid down on a patch of green, watching the sky, hearing the sounds of nature around us, relaxing in an open sky with the Zugspitze behind us. The fun part of it? A storm coming in no time from behind the mountain, heavy rain pouring down like crazy. Lessons learned? Always remember that you need to be geared up for all weather when you’re in the mountain. 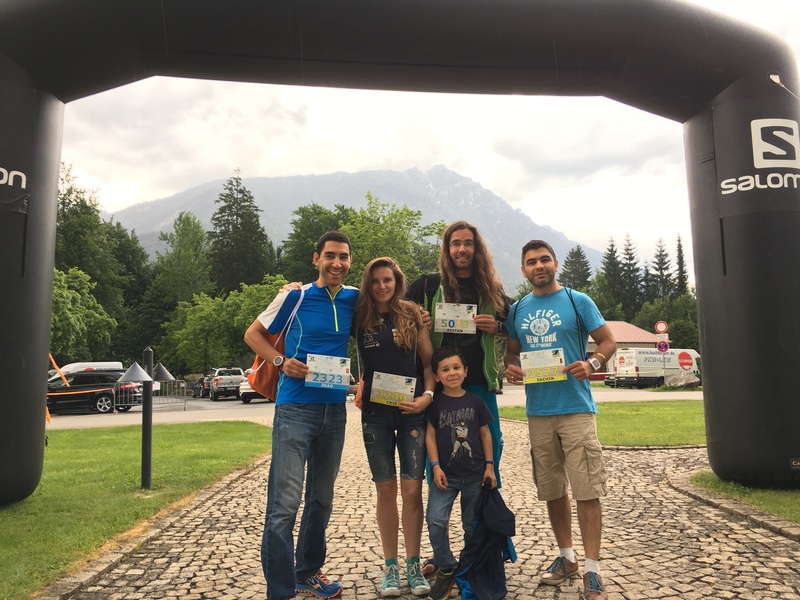 The Zugspitz Ultratrail is, simply put, a fantastic race! It all starts with the location: an area loved by its countrymen, a unique section of the Alps in German territory, gorgeous mountain sights, alpine lakes and a deep connection with nature. It builds up on its ambiance: people are friendly, the race is embraced by the local community, athletes enthusiasm is welcomed by everyone and the air breathes trail running. The race tracks are carefully chosen having runners in mind, presenting a wide variety of distances, while at the same time being challenging enough to put everyone to the test. Last but not least, the organisation is exceptional: thorough coordination between the different municipalities (and countries! ), appropriate reception to the athletes for picking up their bibs and/or leaving their gear for the longer races and, ultimately, aid stations worth praising: friendly staff, free smiles and a great portfolio of supplies. The security check in the morning was properly done to each and every runner. As someone caring deeply about personal safety when trail running, it pleased me to see careful inspection being done, as it provides a fair and level baseline between all runners, while ensuring they’re safe when up in the mountain. Well done! The Supertrail course is very interesting, since it goes north of the Seefeld valley, deep into the mountain, circles it towards Mittenwald, passing close to the Leutascher Geisterklamm, to use thereafter the same track as the smaller race. Aiming at the Zugspitze, it points in its direction all the way to the conclusive challenge or going up to the Bergstation Alpspitzbahn, before the final descent to Grainau. 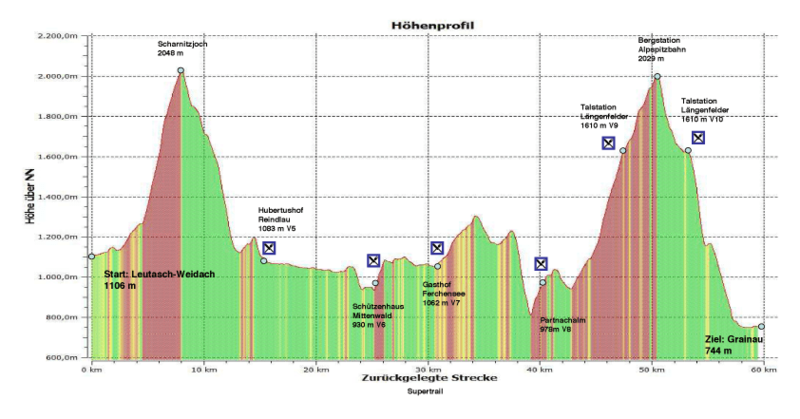 The Supertrail elevation profile follows a different pattern of the usual go-up-the-mountain-and-back kind of profile. With two vertical kilometres, one at the start and another at the end, it is fundamental to play smart during the race, in order to avoid energy issues past the marathon mark. The race day greeted us with amazing weather, considering that the day before there was considerable rain and an unpleasant chilly temperature, getting concerned thoughts on everyone’s mind. With precipitation and wind being the worst enemies of trail runners in the mountain, everyone expected the comeback of the mild June weather. And we were lucky indeed, for as when the start of the race took place, we had a mixture of sunny rays and patches of clouds, a comfortable blend for running… not too warm… not too cold. I made the first ascent accompanied by Robert Kempf, a friend made on-the-fly during the first kilometres. The world is indeed a small place, as I found that he was coming from Oberhausen, a city in the vicinity of Düsseldorf. The ascent to the first summit, being steep, proved challenging as we both perform most of our training in flat lands, if we compare it to proper mountain terrain. Technical, through what seemed to be a dry course of water, with large loose boulders, we used our enthusiasm to push ourselves upwards. Mid-way the path got greener and the view on our backs was unbelievably beautiful. We could see the head of the race high ahead of us, elite runners running non-stop instead of hiking like we did at that stage. Close to the top we could grasp the mountain pass where the 102 km athletes would be passing later, coming from the (now known) Haemmermoosalm. The downhill to the valley was runnable, fast, taking me swiftly to the aid station and marking my departure from Robert. Aside from the passage at the Ferchensee, a beautiful lake at 1,060 m elevation, the course felt uncomfortable in this section. I had mixed feelings between saving energy for the second vertical kilometre and taking advantage of the flat grounds to push a bit the limit. As the mountain grew closer, I met several Bergwacht (mountain rescue service) folks very often along the track, proving once again that safety was well thought of and planned for. The second big uphill took us through a steep mountain pass, covered by a dense forest. A single track meandered between the trees, providing good cover for the sun, which past midday was starting to heat up. To the exception of a few runners here and there, I was on my own for quite a while. And soon enough fighting my demons, as I understood that nutrition in the past couple of hours was insufficient to battle the energy loss from the efforts at stake. Bonking gradually hit me to the point I had to sit down next to a tree and lean over it. Perseverance… rest… resilience… rest… focus… and soon enough I was going up again, mentally stronger, to reach the aid station at the pass. The way down to Grainau accounts for a handful of kilometres, however did take its time. The descent was often steep and segments of mud demanded reinforced caution not to get injured when the finish line was so close. Text messages exchanged with the family and friends waiting at the finish line, everything was ready for my arrival. Cris and Sachin were done from the marathon distance, Stefan was still trailing behind me and expected only to arrive late evening. Tiredness hitting me at last, the Zugspitz Ultratrail – Supertrail proved to be the perfect choice as the second big challenge this calendar year, as I crossed the finish line in glory. A nice distance, a very well organised race, the company of good friends, the excitement of family participating, the sense of achievement by making it to the end and countless memories of all the sensations experienced during the race. The Zugspitz Ultratrail is a race I deeply recommend! If you’re planning a race in Germany, get it on your bucket list!